Just my personal preferences here, Linda. I love the look of hand quilting. It seems to meld into the quilt and enhance but not call attention to itself. The quilt and the quilting become one. On the other hand, much of the machine quilting I see wants to claim the attention of a quilt rather than sharing it. Sometimes I can't get past the stitching to "see" the whole quilt. I also think some machine quilting is too dense. I think the warmth of a quilt comes from the pockets of air created by the unquilted areas. I thought I would love big stitch quilting but I'm not a fan, either of doing it or the finished product. The "thread" seems to shrink more than regular hand quilting thread (in my experience, at least) and instead of getting a nice, old-fashioned crinkle to the quilt, it shrinks into pulls and puckers instead. I'm sure you can tell I'm a hand quilter! Haha. 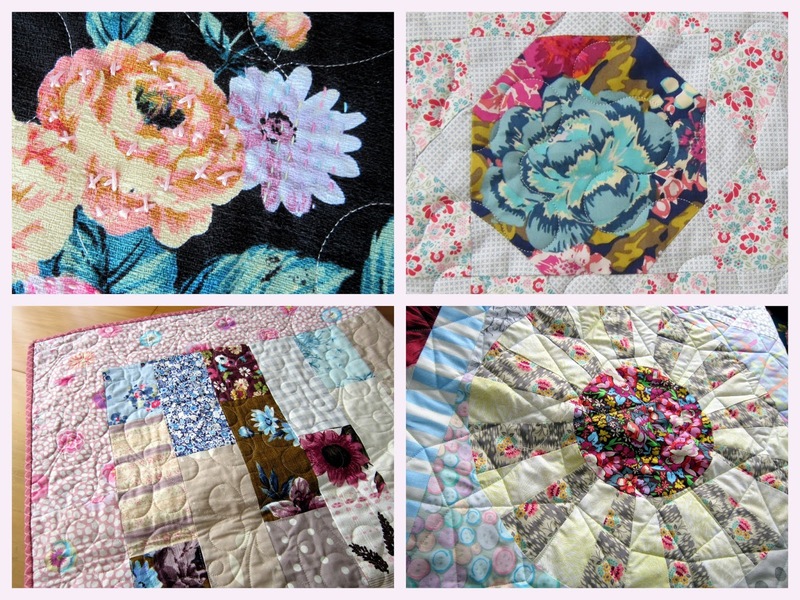 Beautiful quilts tops in the first photo and your 16-patch is gorgeous. I've never sent a quilt out to a long-armer, and do both straight line (ditch) and free-motion quilting with my sewing machine. I love the look of hand quilting best, there's a softness that any machine quilting can't duplicate. If there were enough hours in the day I'd hand quilt everything I make. I haven't mastered free-motion by far, and it's often fairly stressful especially with a large quilt but that's mostly my own impatience. I don't bother attempting to square up the completed quilt top since my quilts aren't for competition but nearly all are for donation or family members. Your long-arm quilter does a very nice job with your quilts, not too dense like some want to do. I am sure I actually get more pleasure just making quilt tops than actually basting and quilting them. I mostly quilt my own, only to save $$. I think you will know my opinion on multiple techniques... I am definitely of the do what works mentality! I learned to FMQ after seeing it on TV and didn't realise that it was supposed to be scary... but have always had problems with straight line stuff... nobody is perfect. I am finally feeling like I have enough techniques up my sleeve to know that I will be happy with what I attempt. I have had one quilt quilted by Leeanne also... And she now has a second one that just ended up too heavy for me to contemplate, although I still have probably at least 10 tops on the quilting pile! Hello Linda. This was a great read for me this morning. I love seeing your "cluster of quilts" on the railing. I think they could stay just like that forever and still be very attractive to admire. I make a lot of quilts...I mean a lot of quilts. I finished 30 last year. I started out as a hand quilter many years ago, but I make too many quilts to get them all done that way. While I love the beauty of hand quilting and the relaxing tone of doing it, I just can't get everything done with a slower process. Out of necessity I learned to machine quilt. I didn't like it at all for awhile, but I have slowly improved and grown to like it. I now see great beauty and versatility in machine quilting. You can do so much with it. I really cannot afford to pay someone to machine quilt for me. For many years I wished I could have sent some off, but I am so pleased with how far I have come with my own FMQ. That skill would have never developed otherwise. I have a friend who is nearing retirement and staring a lower income in the face. She has sent quilts off for years. She has decided to not quilt her future quilts because she doesn't want to quit piecing. Instead, she is going to put a back on them with no batting. They will look great in her house. EXCELLENT post with great questions. I quilted by checkbook for the first 12 years of my quilt making life. Then I retired and decided it was time to learn how to quilt my own. Using my Bernina wasn't an option as it hurt my hands, neck, shoulders too much to wrangle even my lap quilts through the small throat resulting in stitching that discouraged me enormously. So I bought an APSQ George sit down long arm with a 20" throat area. And I've been working ever since to improve my unmarked free motion stitching. I've found three or four most-loved designs to use and tend to use them again and again. 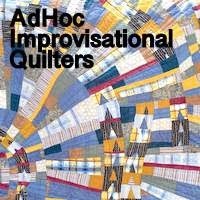 At first I worried that I was over using them but then decided if they make me happy and they make the quilts look good, then finished is definitely better than show-quality perfect. My hand as a maker is in every stitch of the quilts now and that (surprisingly) brings me great pleasure that I didn't know I was missing out on for those first 12 years. I love the idea of adding some big-stitch hand quilting into the mix and, as my irritable CMC thumb joint's arthritis permits, I may try incorporating that on some quilts later this year. All that aside, IF I end up making a quilt larger than my usual, I would still have my longarm friend handle the quilt for me - I continue to adore her work and the joy of receiving a freshly quilted quilt back from her. (bottom line, I don't think there is one "perfect" answer to your questions). Thanks for the shout out. :) I am like you, not at all happy with my free motion efforts. I love the look of hand quilting so much that it's hard for me to be 100% happy with anything else. That being said, there free motion styles that are perfect for certain quilts. I so wish that I could find someone local who I could drive my quilts to, sit down and talk about what I'm looking for and then know that I would be getting back what I specifically asked for! You are so lucky to have found a longarm quilter who works so well with you! Kudos to you for finding a great balance! 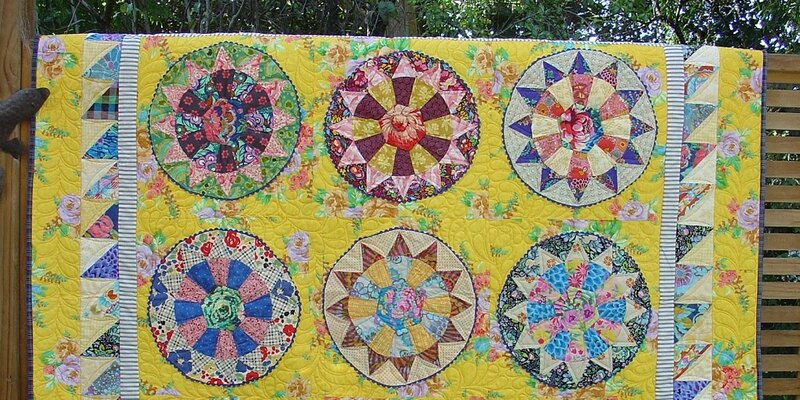 I am definitely a hand quilter and since it is a slow process I have 20 quilt tops waiting for their turn in the frames or the hoop.I tried machine quilting and just didn't enjoy the process. I have sent 2 or 3 quilts out to be quilted and was very satisfied with the results but I guess I'm just selfish. I want the finished quilt to have just have one name on the label, mine. I do more big stitch now than I used to. It's not because I like the look better it is because I can finish up some of the tops that I don't love as much anymore, in a quicker time. If I love the quilt top I can't settle for anything less than hand quilting. I have a couple of pieced tops that I'm planning on tying with yarn. They look like good TV quilts, ones that children won't have to be so careful with and will stand up to more washings. I've thought about just focusing on the quilting of all my tops and waiting to make more till I have reduced the unfinished amount. But, I love piecing and doing applique and I can only hand quilt for a couple of hours a day before my hands and shoulder start to complain. I recently finished piecing a top and feel good that the fabric that has been stored in my stash got use. I was apolgizing to one of my daughters that someday she would have to figure out what to do with all the unfinshed tops. She said, "I'll just sandwich them and tie them and use them so you don't need to apologize." But, the fabric she would get rid of. It kind of took the guilt out of having so many sweet colorful tops hanging in my closet. Just this last week I have enjoyed a very intense free motion quilting class for 3 days. I love hand quilting but it takes a long time. The FMQ is not good enough at the moment but I hope I will try it finishing some quilts. I have used big stitch quilting on one quilt and like the result but i do not like it for every quilt. So I will just enjoy hand quilting and practise FMQ. And hope to finish some quilts. I love making quilts and are so happy to use a newly finished quilt on a bed or take a nap under one. First of all, I like to finish all my quilts myself. I like to say the finished product was all mine plus I never used to have money to spend on someone else to quilt for me anyway. Back when I started quilting quilts were made of old clothes or scraps and it was frowned upon if a quilt was not hand quilted. I'm not sure when long arms came along but I was not even aware of them back in the 70s. I am not good at FMQ and I don't really enjoy doing it but see that it is necessary for all the donation quilts I make. I don't desire to have a long arm or different machine just for quilting and am fine making do with my DSM. I have a few motifs I use all the time now on the donation quilts I don't find them as intimidating to quilt as I did early on. I love hand quilting and find it relaxing. With failing eyesight and carpal tunnel flare ups I am finding it more difficult to do regular hand quilting so mostly have moved on to big stitching and love it plus it goes faster. I would mix machine quilting and big stitching but I can never seem to stitch in the ditch very well. Love your name for the unfinished quilt tops - a cluster of quilts is perfect! I have a gigantic cluster of quilts all lined up, they're not too huge so I intend, at this stage, to quilt them myself.If they're around the 80" or larger then that becomes a challenge for me. I prefer simple quilting patterns and remember hearing comments from Kaffe Fassett at his Auckland lecture last year with his thoughts on quilting - very interesting. I started off with hand quilting thirty years ago and presently I'm working on a small piece by hand but most of mine will be machine quilted. Arthritis seems to be much happier with machine quilting as long as there's not too much wrestling to get the quilt to play well! For years the only quilt finished by someone else was my president's quilt. I started machine quilting then switched to handwork but soon changed back. 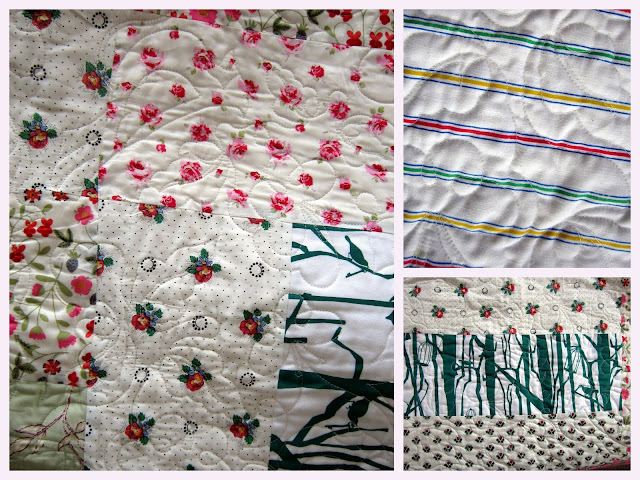 Lately I've sent a few quilts to a friend for long arming. They are just too big for me to wrestle. I'm lucky to have the choice. My quilting has become simpler over the years: I've come to appreciate walking foot straight line and free motion fans. I know where the needle should go next. I think quilts are the most fun artform, the design is interesting, then you can move on and enjoy the artistry of the quilting lines!